Herbs have been used for virtually every condition and medical issue, including menopause. While herbs should still be taken with care and under the guidance of your doctor, they tend to have significantly fewer risks and side-effects than prescription medications. For this reason, many women prefer to use herbs for menopause relief rather than a prescription drug such as Hormone Replacement Therapy (HRT). Dong quai is a relatively well-known herb used in Chinese medicine that is thought to help balance the body's hormones when oestrogen levels begin to decline during menopause. It is also considered somewhat of a tonic for female problems relating to reproductive organs and hormones. Its effectiveness in easing hot flushes is hypothesised as relating to fairly mild oestrogenic effects combined with a number of other actions that provide stability and improved function to a woman's blood vessels. Black cohosh is believed to be a natural precursor to oestrogen and also has anti-spasm effects on the body. It was traditionally used to aid in relieving menstrual problems but more recently, has shown promise in helping women handle irregular periods and other menopause symptoms. Medicinally, liquorice has been used for centuries to treat Premenstrual Syndrome (PMS). It is thought to help menopause symptoms through its effects on oestrogen and to a lesser degree, progesterone. It is considered to help restore balance in the female body and stimulate the adrenal glands, which can help ease a variety of menopause symptoms. 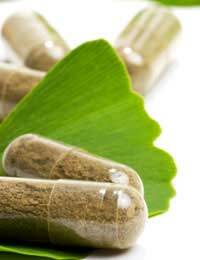 You may already be familiar with gingko biloba, given its use in a large number of nutritional and herbal supplements today. It is believed to exert influence on a woman's vascular system, thus helping to improve cognition during menopause and improve circulation. It works to increase blood flow around the body and in particular, to the brain by enhancing the uptake of glucose to body cells. You can begin by adding in one herb to see if you experience sufficient relief from your menopause symptoms. Some people prefer capsule supplements while others enjoy sipping a herbal tea. Generally, a supplement will contain far more of the active ingredient while teas are much milder preparations. Be careful because although herbs do contain significantly fewer side-effects in comparison with prescription drugs, they can still interact and produce unexpected consequences. It can be a good idea to see a qualified herbalist for advice. Herbs are one beneficial option for treating menopause symptoms, particularly if you are looking for a natural, alternative treatment for relieving your discomfort. Many herbs have been successfully used for centuries to treat problems relating to women's health. If prescription treatments are not appropriate for you – whether due to personal choice, risks or a pre-existing health condition – then consider using herbs to ease your menopause symptoms. With the right herbal treatments, you can soon feel better and look forward to the years beyond menopause.